A husband and wife were having dinner at a very fine restaurant when this absolutely stunning young woman comes over to their table, gives the husband a big kiss, says she’ll see him later and walks away. His wife glares at him and says, “Who the hell was that?” “Oh,” replies the husband, “she’s my mistress.” “Well, that’s the last straw,” says the wife. “I’ve had enough, I want a divorce.” “I can understand that,” replies her husband, “but remember, if we get a divorce it means that you don’t get any more shopping trips to Paris, no more wintering in Barbados, no more summers in Tuscany, no more Ferraris and Lexuses in the garage and no more yacht club. 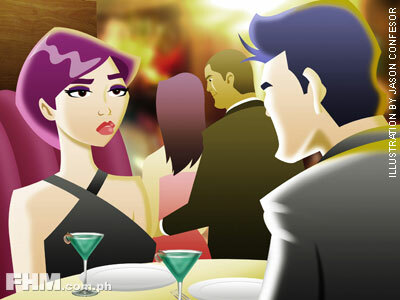 But the decision is yours.” Just then, a mutual friend of theirs enters the restaurant with a gorgeous babe on his arm. “Who’s that woman with Jim?” asks the wife. “That’s his mistress,” says her husband. “Ours is prettier,” she replies.